There's a place on Earth where hot dogs and nachos are health foods, summer vacations last the year round, and punk rockers with mohawk haircuts are looked upon as mello dudes. It's a place where rulers are determined not by their fund raising talents, but by their power to dominate the streets with rad skateboarding skills. Here, the king of the road is none other than that skateboarding maniac - Rodney Recloose, owner of the Flesh 'N Asphalt Skateboard Shoppe. He, along with his freaked-out son, Bionic Lester, and their crazed cronies, Pete and Eddie, rule the streets with iron wheels. They're sort of a nuclear waste version of Al Capone and his once ruthless gang of gangsters. As a newcomer on the scene, with power aspirations of your own, you must prove yourself to Rodney and his free-wheeling weirdos. That means you'd better be on your toes when you challenge friends in free-style and downhill competitions packed with rock 'n rolls and rail slides. And you'd better be on your worst behavior when you come board-to-board with Lester in the "whack 'em upside the head" joust! --From the NES Skate or Die instruction manual. Play Skate or Die Now! If you were a skater in the late 80�s, chances are you owned this game. 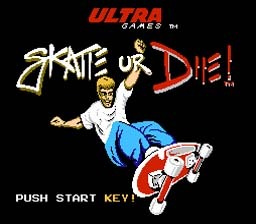 Skate or Die was produced by Konami but published by Ultra Games, and it turned out to be a really fun skating game. You play as yourself and your main goal is to rip up your competition to gain top dog status on the streets. Your main enemy is actually the son of the skateshop owner, Rodney Recloose. Rodney�s not so bad but his son Lester is a dolt and he�ll try to thwart your efforts to be the best. Get totally gnarly on your board and thrash your opposition, dude! Ugh, I�m going to be sick; nostalgia overdose. Against Lester and his cronies, or even one of your friends, you can compete or practice in 5 events. Freestyle is my favorite, which is just the old school term for vert ramp. Then you�ve got High Jump, which is basically the vert ramp with a ruler attached to the coping. Jam is kind of a downhill obstacle course that can get really annoying because it doesn�t really matter how many times you mess up, as long as it�s not at the end. Race is what it says, but be careful because the controls get a little hairy in this mode. Joust is a total rip-off of American Gladiators but with an X-Treme twist. Dynamic Controls The controls vary from event to event so consult the game�s manual for a detailed description of event controls. If you want to win the Jam event, just play it ultra safe at the end and make no mistakes. Because the computer always keeps you in close competition with Lester, a perfect end will win the event for you.